The third round of the 2015 Monster Energy Supercross, an FIM World Championship, took place at Anaheim, and it was a doozy for many reasons. We saw (in my opinion) the coronation of an upcoming champion, an amazing ride by a couple of riders in the 450SX Class, and some major controversy. Yeah, it was a busy night. And there are fourteen more rounds to go, bro! Get your tickets now! It’s not #whosnext; it’s now #whatsnext. Click here for the black flag incident. But first: the track. It had an over-under bridge, which is always awesome. People always want to know what my deal is with an over-under bridge and why I’m so giddy when they’re out there. It’s for a number of reasons, really. Visually, they’re a striking obstacle. Like a supermodel coming out of the water in a tiny bikini or, to just pick a random rider, Sebastian Tortelli in a Thor ad, the over-under bridge is just cool looking. It’s a mini-tabletop on its own. With a jump in front, it’s a step-up. Adding in a bump before and after makes it an on-off, although that would be gnarly. It looks awesome, offers variety, and opens up the track for some creative designs; it opens up a world of possibilities. It’s like that wardrobe leading to Narnia. This week’s track was pretty good. It needed to have tougher whoops. I don’t know what they were thinking in that split-lane because one side was slower and no one took it. And, again, two triples equal two big ol’ yawns. It’s time to think about some new obstacles. The good was the over-under bridge (duh), and the rhythm lanes were good because Eli Tomac busted out a quad. Anytime there’s something on the track that rewards the very best (and ballsiest) riders in the field is cool with me. We’ll get to the winner of the race here in a bit, but the big news out of A2 was Chad Reed getting the black flag and being disqualified. Yes, you read that right. Reed was upset over Trey Canard’s attempted…something. (I don’t know what he was trying to attempt to be honest.) After both riders picked up their bikes, Reed bumped Canard to let him know that he was not happy. Unfortunately for Canard and Reed, Trey had only one hand on the bar and the small bump sent him into the Tuff block and onto the ground. That was enough for the race officials, and they DQ’d Reed on the next lap. Let’s review this step by step, shall we? 1- Canard made the first mistake by launching off the jump too far and landing on Reed on the inside. He obviously didn’t mean to do it, and after the race he said that he thought Reed was going to the outside in the turn. It wasn’t a smart move by Trey; I’m sure he would take it back if he could, but it was also a racing incident that I’ve seen many times before. Canard was going faster than Reed. He saw the pack getting away and he knew he had to get by the #22. The rider in front has the right to go where he wants to on the track, and Canard knows this. He had to be smarter in this situation. 2- The second mistake was Chad deciding to retaliate. Reed probably didn’t intend to knock Canard down. He couldn’t see Canard only had one hand on the bar, but one bad move doesn’t deserve another. I get that Reed was angry, but there’s no place for the revenge bump. 3- The third mistake was the biggest: giving Reed the black flag. Why not let him finish the race, watch some video, talk to the people involved, and then DQ Reed if necessary? I wouldn’t have even agreed with that, I personally think a DQ would have been too much, but hey, whatever, y’know? Reed deserved some type of penalty. But in my opinion, his action didn’t deserve a DQ, and especially not an immediatedisqualification from the race. John Gallagher, the FIM’s representative at the race, said that he threw it because he thought Reed would keep retaliating against Canard if he was allowed to keep racing. This is laughable; Reed’s not some sort of Terminator out there exacting revenge on poor Trey Canard over and over. C’mon bro, it was a simple bump and then he continued racing. Things should get more interesting from here in regards to that, but things might get less interesting if Kenny Roczen keeps doing what he’s done in Anaheim. Roczen took the lead early and checked out. “See ya later,” or “Bis spater” if you’re German. Roczen's won both in Anaheim so far. 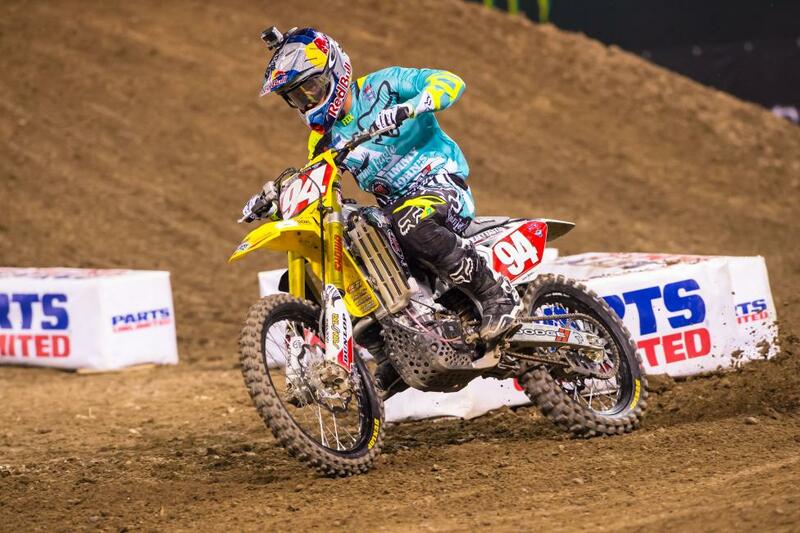 Roczen looks better than ever on his new Suzuki, and his ride at Anaheim 2 was a lot like Anaheim 1. Roczen’s the perfect mix of riding style, aggressiveness, and fitness. He rarely looks out of control or sketchy at all. Tomac was quadding in the one rhythm lane and also tripling in the split lane, which one might think would make Roczen nervous, but Kenny said on the PulpMX Show that he saw it and wasn’t worried. He wasn’t sure it was faster and he said he was in the lead, so why push it? He has a 12-point lead in the series after three races—not too bad. I think Tomac and Canard can race with Kenny—they have the speed—but they need to have good starts. 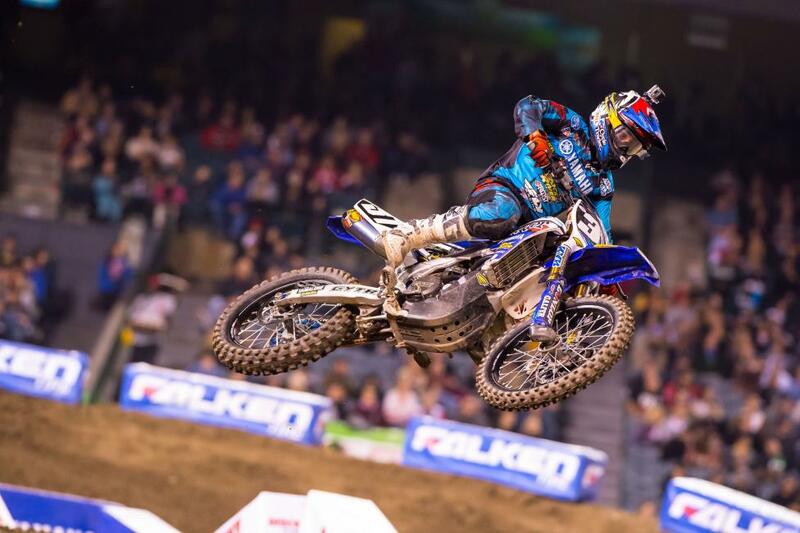 The 250SX main event had two huge series-swinging moments. The first is Jessy Nelson crashing while all alone in front. Nelson, who was the quasi-surprise winner at A1, was in complete control of A2 when he went down in a weird spot. More on why I think he crashed below but that crash was the first TSN turning point. Had Nelson won the race he would be in control of the series with perhaps a 10-point lead. But he crashed and lost the hold on the series. The second turning point was Cooper Webb making the pass on Tyler Bowers on the last lap, and taking the win. Cooper was so far back off the start that he was practically last—it was a bad start. At the end of the first lap he was twelfth. He had made it up to seventh by lap five; it was officially on. Webb rode fantastic to catch Bowers and make the pass. It was the type of ride that can turn a series around. Webb got his first win last week and his second win in an exciting fashion this week. Does anyone want to bet against him winning this weekend? With his pedigree, his bike, and his skills, Webb’s got the look of a future champion, and it wouldn’t surprise me one bit if Anaheim 2 proved to be the point when Cooper weaved his web of magic and turned the series to his favor. What a ride! I spoke with GEICO Honda team manager Mike LaRocco on the track walk and learned that the entire GEICO Honda team has switched to KYB suspension for 2015. It only took me three rounds to notice this. Anyway, Mike was talking about young kids breaking into supercross, and how he works with them in testing. He doesn’t want to overwhelm them with options, but at the same time, because he’s ridden the bike and knows how things work, he wants to see what they see out there. There are a lot of things to point to as far as how far the GEICO Honda team has come in the last three to four years, but hiring LaRocco was no doubt a big part of this resurgence. Mike’s a very cerebral guy; he’s soft spoken, but he’s got a great sense of humor once you get him to talk. I swear this is all true. And I think he’s also very tired of me asking him to tell the story about him and Mike Kiedrowski getting into a fight at RedBud back in the day. Let’s take a look at the results, shall we? 1. 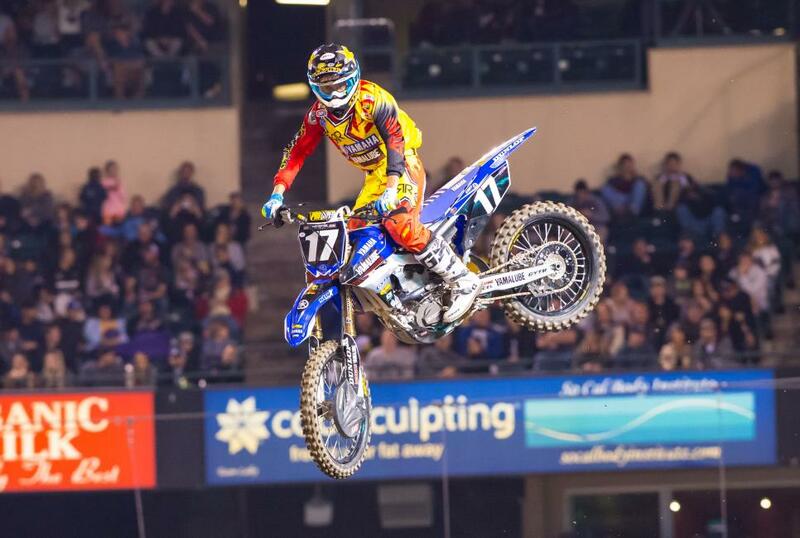 17 Cooper Webb; Newport, NC; Yamaha YZ250F – As a reader pointed out to me, the #17 has really been on fire lately. Justin Barcia, Eli Tomac, Jason Anderson, and now Webb have made the number look great. No coincidence, either, that #17 was also worn by Wendel Clark, perhaps the greatest hockey player of all time. 2. 911 Tyler Bowers; Corona, CA; Kawasaki KX 250F – To the people coming down on Bowers for leaving the door open for that last lap pass by Webb: What was he supposed to do? He had to go outside to jump the triple, and if he didn’t, then Webb would have just ridden around him by jumping the triple. Bowers rode great, for sure, but Webb rode greater. 3. 32 Justin Hill; Yoncalla, OR; KTM 250 SX-F – Hill’s been just ok to start the season, and his brother Josh told me that he suffered a concussion right before the season started and also was sick for a while. Some of this might explain his results. Then again, he’s been good—just not a title contender like we thought after his performance in the Monster Energy Cup. 4. 16 Zach Osborne; Chesterfield, SC; Husqvarna FC250 – As we all know, Osborne is battling a thumb injury. So, to see him going backwards isn’t that surprising; he’s probably not riding much or at all during the week. I thought he did some serious damage to the thumb in the heat race when he slowed to a crawl late in the race. But, oh no, Wacko Zacko pulled the holeshot in the main and led for a couple of laps before settling for fourth. 5. 34 Malcolm Stewart; Haines City, FL; Honda CRF250R – Mookie had a quiet night. He was right there off the start and just kind of slowly faded back. It wasn’t a terrible race—just kind of so-so. 6. 28 Jessy Nelson; Paso Robles, CA; KTM 250 SX-F – Like I said, what could have been! If Jessy hadn’t fallen he would have, in my opinion, won his second race of the year. He was looking great when the over-under bridge got him. I know he crashed after it, but he had been struggling with it a few laps before the crash, both over-jumping it under-jumping it, and that it was in his mind (or maybe just mine?) when he strangely lost it after the bridge. 7. 100 Joshua Hansen; Elbert, CO; Kawasaki KX 250F – Hansen hasn’t been as fast as a lot of us thought he would be, but A2 was his best finish so far. Maybe the fact he was involved in some controversy with McElrath can be traced to his good finish? Hanny can’t stay away from drama, and maybe it feeds him like that creature in Super 8? Jason Weigandt doesn’t understand this movie reference, which makes it even better. 8. 31 Alex Martin; Millville, MN; Yamaha YZ250F – Martin mutilated his bike in a crash in the second practice, so he only had one practice to figure everything out. Knowing that, an eighth is pretty good. I’d like to know the number of times Martin has placed between fifth and tenth in a 250SX main event. I set the over-under at eighty-five. 10. 40 Shane McElrath; Canton, NC; KTM 250 SX-F – McElrath won a heat race, which is major impressive. Great job by him. As I’ve been writing each week, he’s starting to get it. The light is coming on for him. Unfortunately for him, Hansen punted him into the mechanic’s area, so this was the best he could do in the main. Still, with a heat race win, A2 was a success for him. 11. 57 Jackson Richardson; Wildomar, CA; Honda CRF250R -­ We have to just start penciling Richardson into the mains now. He’s been solid, and after three rounds the Australian privateer has shown the ability to pass his way to the front. 12. 86 Zackery Freeberg; Riverview, FL; Yamaha YZ250F – Did you know that Freeberg’s mechanic is Adam Cianciarulo’s practice bike guy? Did you know that he also won the top tech award at A2? Did you know that he loves the PulpMX Show? Did you know that I forgot his name? All facts, bro. 13. 157 Aaron Plessinger; Hamilton, OH; Yamaha YZ250F – Plessinger was getting ready to pull a “Plessinger,” where he starts around tenth and then uses speed and fitness to charge up late in the race. But then he went down and was almost last, so we didn’t see a “Plessinger” this week at all. 14. 981 Austin Politelli; Menifee, CA; Yamaha YZ250F – Politelli had terrible practices all day and then crashed out in his heat. He then won the LCQ in a nice ride. Really, fourteenth is a good position for him. Austin’s a very talented rider and is capable of more, but this finish was making the best out of a bad day. 15. 85 Landen Powell; South Jordan, UT; KTM 250 SX-F – Powell got in through the LCQ, and anytime a rider has to do that, any sort of decent finish in the main is fine. 16. 61 Michael Leib; Menifee, CA; Honda CRF250R – Leib crashed hard in his heat race and toughed it out in the main event. He’s not sure if he’ll be able to race this weekend in Oakland. Let’s hope he’s able to make it. 17. 71 Cole Martinez; Rimrock, AZ; Yamaha YZ250 – Martinez is the fastest “no name” guy in the main each week. (I mean that in the best way possible.) He’s been in every main and now just needs to get closer to that top ten. 19. 44 Zachary Bell; Cairo, GA; Husqvarna FC250 – Bell started the race and then rode off with either a foot injury. Bummer. 21. 217 Ryan Breece; Athol, ID; Yamaha YZ250F – Breece makes another main on the year, and it’s a week after he was profiled on Pulpmx.com. I don’t think this is a coincidence. 22. 66 Chris Alldredge; Powell Butte, OR; Kawasaki KX 250F – Rough start for the rookie, as he was looking strong until he ate poop before the finish. After the race, team owner Mitch Payton said he’s fine, but so far Alldredge has gone DNQ-15-DNF in his first three supercrosses. No one said it was going to be easy. 2. 5 Ryan Dungey; Tallahassee, FL; KTM 450 SX-F – I was talking to Carlos, Dungey’s mechanic, and he was telling me how light the new KTM bikes are. The team is actually adding weight to the bikes to make sure they’re over the 220 lb. lower limit. As a former mechanic at Yamaha, I can’t believe a 450 four-stroke is under the weight limit. That’s amazing stuff. 3. 3 Eli Tomac; Cortez, CO; Honda CRF450R – Tomac will take this result after his start. In an exciting moment, Eli just soared way above the rider next to him while quadding. Yep, he’s awesome. 4. 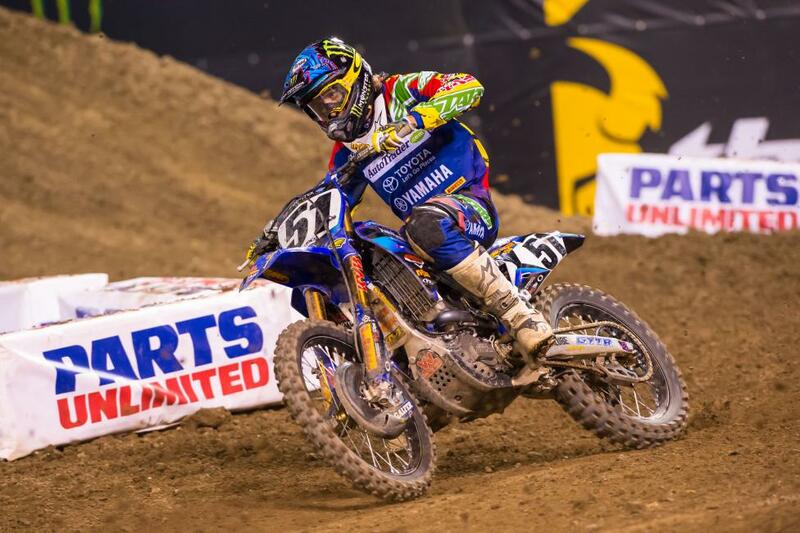 51 Justin Barcia; Greenville, FL; Yamaha YZ450F – There’s hope after all! I’m kidding, but last week there were plenty of people concerned with Barcia’s rides. (I was not one of them.) He qualified fastest, which has to be a huge shot of confidence for him and the team, and although his starts still aren’t great, he had his best race of the year in Anaheim. 5. 20 Broc Tickle; Holly, MI; Suzuki RM-Z450 – Great job by Tickle in a nice ride overshadowed by #blackflaggate. Tickle’s had three solid races and is creating a nice little story here. 6. 14 Cole Seely; Laguna Beach, CA; Honda CRF450R- This was Seely’s best finish of the season, and he was catching Tickle at one point before Broc turned it on at the end of the race. Seely’s been very quiet through three races, but I expect that to change. 7. 21 Jason Anderson; Edgewood, NM; Husqvarna FC450 – Anderson was right up there before he had no choice but to hit Short when he cart-wheeled. Jason got up outside the top ten and charged up to this spot. Anderson’s been great—no doubt about it. 8. 15 Dean Wilson; Wesley Chapel, FL; KTM 450 SX-F – Wilson asked me if I was writing bad things about him before the race. I had to admit I was, because after all, he had qualified fifth and third at the first two races and faded badly in each of the mains. He understood and said he’ll be better. He’s been battling arm pump, but he has a new trainer and has been working hard to figure it out. And you know what? He was much better at A2, and he came from tenth to this spot. Trust me, this was way better. 9. 18 David Millsaps; Murrieta, CA; Kawasaki KX 450F – Millsaps went from second to ninth, and that’s not his usual move. This is not the old Davi Millsaps anymore, folks. Something’s up with him—no doubt about it. He’s better than this. I’m not sure what’s up, but hopefully he isn’t having foot problems again. 10. 4 Blake Baggett; Grand Terrace, CA; Suzuki RM-Z450 – Blake got this result with a crash, so that’s pretty good, right? He’s been very consistent in his rookie year on a 450. 12. 24 Brett Metcalfe; Lake Elsinore, CA; Suzuki RM-Z450 – Metty rebounded from a poor Phoenix with a pretty good Anaheim. I‘ve heard he’s only doing the first six races, but I’ve also heard he’s doing them all. I guess I could just ask him, right? Great journalism by me. 13. 11 Kyle Chisholm; Valrico, FL; KTM 450 SX-F – Ignore that “KTM 450 SX-F” next to Kyle’s name; he hasn’t ever raced a KTM, but it’s there for some reason. Kyle’s on a Kawasaki. I call a black flag on the AMA for their results sheets. 14. 27 Nicholas Wey; Dewitt, MI; Kawasaki KX 450F – The NYK made his first main of the year and put in a nice result in his 842nd career main event. 15. 42 Ben LaMay; Forney, TX; Yamaha YZ450F – LaMay rode well. He probably deserved to make it last week, but better late than never. LaMay had a nasty crash in practice that left him with a sore wrist, so this result was even more impressive. 16. 53 Jimmy Albertson; Shawnee, OK; Yamaha YZ450F – Top Jimmy pulled the holeshot from way outside, which is pretty cool. Sure, he flew off the berm at the end of the first straightaway, but it’s still impressive he was able to do that from way out there. 17. 12 Jacob Weimer; Wildomar, CA; Kawasaki KX 450F – Off night for Weimer. Maybe the moto gods got him back for blowing me out on Instagram? 19. 800 Mike Alessi; Hilliard, FL; Suzuki RM-Z450 – The #800 hurt his knee at some point, but on the good news front, he won another heat race. Seriously, he rode great to take the win, and it was nice to see. Does anyone know if MotoConcepts is going to race outdoors? I would go ask, but I don’t want to sign any contracts. 20. 33 Joshua Grant; Wildomar, CA; Kawasaki KX 450F – I didn’t see it, but people who did said Josh was lucky to escape a more serious injury when he over-jumped the triple in the split lane, got whiskey throttle, and almost went into the stadium wall. He called it a night after that. Grant’s off to a horrible start so far. 21. 29 Andrew Short; Smithville, TX; KTM 450 SX-F – Shorty was right there in second before coming up short and going over the bars. He’s way too old to be doing that, and he’s lucky he didn’t turn into dust when he landed. I’m kidding. But it was scary and we’re all glad he’s okay. 22. 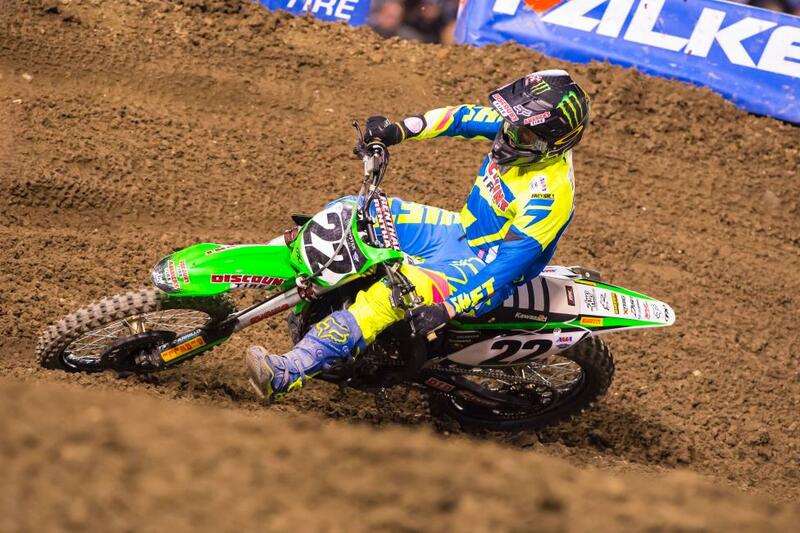 22 Chad Reed; Dade City, FL; Kawasaki KX 450F – Hey the #22 got twenty-second! - Attention industry, fans, and riders. There are three practice sessions during the day at a supercross. Three! The first one is officially “untimed” yet still timed. (It wasn’t for a while, but the teams asked if the equipment could be turned on for knowledge purposes.) The last two count for qualifying order. Just because the first practice doesn’t count towards qualifying, you’re still out there practicing. THEREFORE, THERE ARE THREE PRACTICES and should be referred to as such. I cannot understand riders telling me about the first practice but referencing the second practice. Am I crazy? Why can’t people grasp this? - Justin Brayton hasn’t been having the season he wanted to on his new BTOSports.com KTM ride, and things went from so-so to bad when he hurt his shoulder in the semi race. He’ll be out for a few weeks. Weston Peick tried to race after a foot injury last week and did more damage on the second or third lap of practice. Now he’ll be out as well, and “Filthy” Phil Nicoletti gets back in as the fill-in on the AutoTrader.com/Toyota/JGR Yamaha team. And this just in: Coy Gibbs and his “Break glass for Filthy in case of injury” idea is still paying off big time. - Chad Reed was eighteenth fastest in the third practice session. Eighteenth! How is this even possible? I understand he’s not a speed demon in practice, but eighteenth? I would have thought he could chop a leg off and be twelfth or so. It’s weird, man. - Short was back to wearing two white boots—thank god. He told me that he’s been getting a lot of feedback from fans that they liked the completely different neon boots he had been wearing. No word if it was Stevie Wonder and the ghost of Ray Charles. Thanks for reading. No seriously, thanks. Email me at [email protected] if you want to chat or call me names. BTO Sports is your number one source for all of your motocross parts, gear, accessories and apparel. BTOSports.com is a motocross company who is truly dedicated to the sport and to the customer. Proud sponsor of your Racer X Podcasts and the BTO Sports race team.